Yesterday’s Shoulders and Arms went reasonably well. The cold is ebbing, the shoulder is feeling pretty good. So I was able to increase weight in a couple of moves since last week. Ab Ripper X went better, although Fifer Scissors was still painful. The moves that raised the heart rate the highest were: Alternating Shoulder Presses and Deep Swimmer’s Presses. The moves that challenge me the most are: the “Outs” of In & Out Bicep Curls and Static Arm Curls. My left arm (bicep) always struggles with the second static hold. Dinner yesterday was beef bourguignon. It’s the first time I’ve prepared this meal since embarking on the journey of all things P90X. That, unfortunately, meant the recipe needed to be modified. I eliminated all the bacon and substantially reduced the oil/butter content. By sauteing the pearl onions and the mushrooms together, I was able to do both with a single tablespoon each of olive oil & butter. All of this was served over a plate of whole wheat/whole grain pasta. How was it? 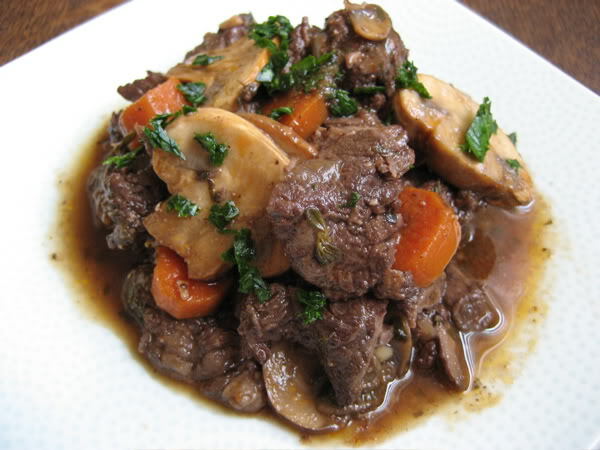 Well to be honest, beef burgundy suffers without any bacon. Too much flavor is sacrificed. In the future, I’ll add a few strips. Otherwise, It was pretty darn good and relatively healthy. This entry was posted in P90X-Insanity Hybrid, Round 3 and tagged Ab Ripper X, beef burgundy, Calories, Diet, Heart Rate, P90X-Insanity Hybrid, Shoulders & Arms. Bookmark the permalink.